Kid's shoes are a big deal around here. The boys seem to be constantly outgrowing shoes, and when they are not busy outgrowing them, they are busy tearing them up.. So, needless to say, shoes are a constant battle around here. 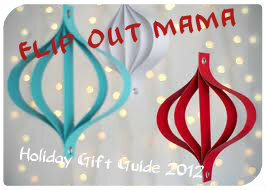 When we had the chance to team up with Pediped Footwear for our Holiday Gift Guide, we knew it would be a perfect match! Pediped has been around for a long time, I bought their shoes when Tater was first born, and they are a trusted name in kid's footwear. 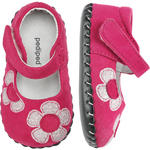 Pediped's motto is "the next best thing to bare feet", and it fits perfectly! 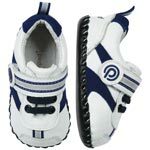 They make great quality shoes that are perfect for babies that are just starting to walk, and beyond! I have always been a fan of their products and the pair we got to review was no exception! Beanie was the recipient of these adorable little loafers! They are so cute, definitely my favorite shoes that he has! He usually wears tennis shoes, but sometimes I like for him to have a different option if we are going somewhere nice, and these are perfect. He LOVES them! he calls them his "big boy shoes" LOL. 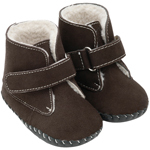 They are really comfy on his little feet, and extremely well made. I have no complaints about these adorable shoes. They have been a great addition to Bean's wardrobe, and if anyone can put shoes to the test, it's him! I am so happy that we have these shoes now as a backup to his regular ones. They are definitely our favorites! 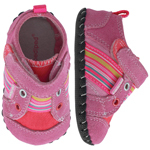 If you are in the market for some great shoes for your little one, Pediped is definitely the place to get them! Can you tell, we LOVE Pediped??? They have the best shoes at the best prices! If you are in the market for some great kid's shoes, just go here to get the best ones! Oh these look so cute! Carter is just about to need a new pair of shoes soon! I will have to go and check them out! I LOVE those loafers too!